Blurb: The story of Mr. White and the agency deepens in this continuation of the Dreamweb saga. 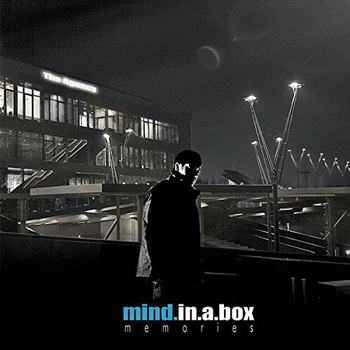 The sixth full-length album from Austria’s Mind.in.a.Box, Memories is the follow-up to 2012’s Revelations and continues to delve deeper into the world of the Dreamweb, the resistance, and their fight against Mr. White and the agency. Steeped in science fiction flavor and awash in the band’s signature otherworldly synth-heavy sound, those familiar with Mind.in.a.Box will find an album that’s short of surprises but exceptional in execution, and one of the act’s most atmospheric and vividly cinematic to date. Starting with the mood setting and storytelling track, “Travel Guide,” Mind.in.a.Box refreshes us on the dark and dreamy cyber noir world the band has constructed. “I Knew” gets things truly started with the heavily distorted female vocals found in stellar older tracks like “Amnesia” acting as a siren’s call, bewitching the listener early on. Other early tracks such as “Unforgiving World” and “Synchronize” show that the Mind.in.a.Box formula is still just as effective with its exceptional vocal hooks and the grand complexity and scale of its synth arrangements. “Bad Dreams” is a mellow down-tempo track that is well placed as a palate cleanser after the series of bombastic tracks that preceded it, but though the song eventually builds to a more intense conclusion, it is still one of the more forgettable entries on Memories. As the album wraps up with “5ynchr0ni7e,” Mind.in.a.Box takes the outro to new levels with this incredibly cinematic track that describes the experiments of Mr. White to break into the Dreamweb; it’s really a stunning finale to the album and brings the world to life. Those looking for anything drastically different from Mind.in.a.Box’s previous work may be a bit disappointed with Memories, but it’s similarly a testament to the talent of the band members that they’ve been able to produce consistent and cohesive music across the five albums that have breathed life into this grand Dreamweb saga. Memories has all the haunting vocal hooks, complex structure, and rich synth work that makes Mind.in.a.Box one of the most distinctive and intoxicating futurepop acts out there, but it’s the story of the Dreamweb that gives the music a life beyond the beats.